Check up on all of the PMI Racing team's races. Check out photos from our races. Contact us for race or sponsorship information. We started as a group of friends from Southeastern Wisconsin that share a passion for the sport of snowmobiling. Over the last five years, we have turned this passion into a highly motivated, well respected race team. We have expanded our program this year to include three different races held in eight different locations, some of which will be here in our own backyard! In doing this, we are hoping to reach out to a wider range of sponsors for the potential of new and exciting sponsorships, gaining even more exposure with people in the area. 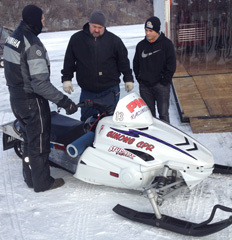 PMI Racing participates fully in snowmobile racing throughout Wisconsin and beyond. Our team is dedicated to having fun, winning races and spending time with friends and family. The Smith Family have been avid snowmobilers for many years and this passion turned into PMI racing. The Smith Family are Wisconsin natives and reside in Metro Milwaukee in Brookfield and Lakewood (Archibald Lake) Wisconsin.